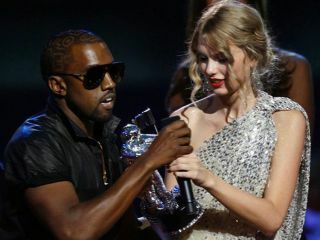 Kanye West has issued an apology to country-pop artist Taylor Swift for his bum rushing the stage last night after Swift won an MTV Video Music Award for her song You Belong To Me in the Best Female Video category. Before Swift (who was visibly surprised at winning), could even get to her thank-yous during her acceptance speech, West jumped on stage to voice his displeasure with the outcome of the vote. "Yo Taylor, I'm really happy for you, I'll let you finish," he stated. "But Beyoncé has one of the best videos of all time. One of the best videos of all time!" West was referring to Beyonce's video to the song Single Ladies (Put A Ring On It). The audience was stunned and quickly started booing West - and applauding Swift, encouraging her to continue her speech. As West dashed off stage, Swift tried to regain her composure, but before she could utter another word, MTV cut to pre-taped video featuring Eminem and comedian Tracy Morgan. Stars such as Kelly Clarkson and Pink (both of whom were nominated in the same category) blasted West, and today music forums everywhere were slamming the rapper-producer's antics as "thoughtless and inexcusable." "I'm sooooo sorry to taylor swift and her fans and her mom," he wrote. "I spoke to her mother right after and she said the same thing my mother would've said. She is very talented! I like the lyrics about being a cheerleader and she's in the bleachers! …………………… i'm in the wrong for going on stage and taking away from her moment!" Still, West maintained his opinion that Beyoncé should have won a Moon Man, writing, "beyonce's video was the best of this decade! I'm sorry to my fans if I let you guys down! I'm sorry to my friends at mtv. I will apologize to taylor 2mrw. welcome to the real world! everybody wanna booooo me but i'm a fan of real pop culture! No disrespect but we watchin' the show at the crib right now cause … well you know! "i'm still happy for taylor! Boooyaaawwww! you are very very talented! I gave my awards to outkast when they deserved it over me… that's what it is!! i'm not crazy yall, i'm just real. Sorry for that! I really feel bad for taylor and i'm sincerely sorry! Much respect!!" So what do you think? Is Kanye West being sincere in his apology to Taylor Swift, or merely trying to save face?